Macular degeneration, also known as age-related macular degeneration (AMD), is a medical condition which can severely impair vision. In fact, it is a leading cause of vision loss among people age 50 and older1. There is no cure, however, it can be treated with vitamins, laser therapy, medications, and vision aids. The early and middle stages of AMD usually start without symptoms. Blurred vision is a key symptom but it may be a later sign. 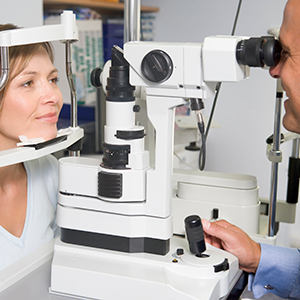 A comprehensive dilated eye exam is the test used to detect AMD. For people who may be unable to verbally communicate changes to their vision, watch for changes in their walking, grasping objects, activities, or loss of interest in activities requiring central vision (for example, watching TV, reading, sewing, writing). More importantly, ensure that annual eye exams are completed by an eye care professional. What are some lifestyle choices which may decrease risk? Treatment will depend on the stage and type of your AMD. Each person should have a personalized treatment plan that is right for them. Vision may not be able to be restored, however low vision services can help make the most of what is remaining. Support should be a team effort and include the person with AMD and an ophthalmologist, as well as occupational therapists, orientation and mobility specialists, certified low vision therapists, counselors and social workers. Vision rehabilitation programs may be helpful by providing training for magnifying and adaptive devices, guidance on ways to complete daily living skills safely and independently, methods to modify the home, and information on where to locate resources. AMD may not be noticed or diagnosed until it has progressed. Have your eyes examined regularly by an eye care professional. For more information, go to https://www.pchc.org/resources/hpaps to see a Health Promotion Activity Plan (HPAP) for macular degeneration.